President Barack Obama was harshly criticized by veterans groups Monday over a controversial plan he has proposed to bill veterans' private insurance companies for the treatment of combat and active-duty related injuries in order to generate half-a-billion dollars in 2010 for the Department of Veterans Affairs. Currently, VA covers those costs, and bills veterans’ private insurance only for treatments unrelated to a veterans’ military service. Critics of Obama's proposal, who include a number of Democrats in both Houses of Congress, said Obama’s plan could end up discouraging employers from hiring disabled veterans because it could raise employers’ insurance premiums. “I got the distinct impression that the only hope of this plan not being enacted is for an alternative plan to be developed that would generate the desired $540-million in revenue," Rehbein said. He added that American Legion "has long advocated for Medicare reimbursement to VA for the treatment of veterans" and he plans on presenting his proposal to the White House on Thursday. "This, we believe, would more easily meet the President’s financial goal," he said. White House spokesman Robert Gibbs said Tuesday Obama has not made a decision on his proposal. "The president and the [veterans groups] had a good conversation, and veterans can be assured that the president understands any concerns that they would have," Gibbs said. "The budget the president has proposed represents an historic increase in discretionary spending to take care of our wounded warriors: those that have been sent off to war, have protected our freedom and have come back wounded." The meeting Monday afternoon included Obama’s Chief of Staff Rahm Emanuel, Secretary of Veterans Affairs Eric Shinseki and Steven Kosiak, the overseer of defense spending at the Office of Management and Budget (OMB). The backlash directed at Obama after Monday’s meeting appears to have caught White House officials off-guard. To quell the anger, Emanuel has scheduled another sit-down with the organizations and their representatives on Thursday to further address their concerns about Obama's plan. Rehbein, however, opposes the plan on moral grounds. “If the president and the [Office of Management an Budget] ant to cut costs, they can start at AIG, not the VA," Rieckhoff said, referring to the insurance giant that received $170 billion government bailout. To be fair, Obama’s proposed 2010 budget for the VA, which he recently unveiled, calls for a $15 billion increase above 2009 levels. The $113 billion request includes $52.5 billion in discretionary funding, an increase of $4.9 billion from 2009, or 10.3 percent. The bulk of discretionary spending goes to VA medical care. By contrast, the Bush administration routinely underfunded VA and shortchanged veterans even as the Iraq war raged. 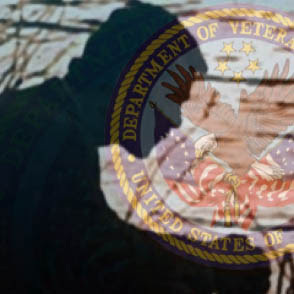 Bush proposed a 0.5 percent budget increase for the VA for fiscal year 2006, which amounted to a “cruel mockery” of Bush’s promises to do everything to support veterans and soldiers, Rep. Lane Evans, D-Illinois, said at the time. Evans called Bush’s proposed budget increase for the VA “grossly inadequate,” saying it would force the VA to “ration” healthcare to veterans. VA officials had testified in 2005 that the agency needed at least a 13 percent increase to meet the needs of hundreds of thousands of war veterans wounded in Iraq and Afghanistan and others who needed long-term mental health care. Simultaneously, Bush was resisting congressional efforts to beef up the VA’s budget. In May 2007, Bush threatened to veto legislation that sought a 10 percent—$3.2 billion—increase, calling it too expensive. Bush proposed a 2 percent increase, far below what lawmakers and VA officials said was needed to treat a dramatic increase in traumatic brain injury and PTSD cases. After Congress passed the legislation with the higher VA spending, Bush backed down on his veto threat but that was largely due to the fact that every Republican in the Senate with the exception of Jim DeMint of South Carolina, supported the measure. Last week, Rep. Bob Filner, the House Veterans' Affairs Committee Chairman, said during a hearing last week that Obama’s budget proposal for VA “marks the first time any president has submitted a budget that exceeds the recommendations of the Independent Budget. But Filner requested an additional $600 million from the White House to cover the health care expenses that Obama said he could raise by billing private insurance companies. Filner said his committee does not support Obama’s plan to bill insurance companies. During the same committee hearing, Rep. Mike Michaud D-Maine, told Shinseki that Obama risks losing votes on his budget proposal for the VA if he intends to try and win support for his plan to bill insurance companies for treating veterans. “It's unconscionable and it is an insult to our veterans who have been hurt overseas,” Michaud told Shinseki. Although Rehbein said he believes Obama won’t back down from his proposal, Sen. Patty Murray, D-Wash., who sits on the Senate Veterans’ Affairs Committee, told Shinseki last week the proposal would be “dead on arrival” if it is formally presented to the Senate. Murray also expressed her opposition to the plan during a phone call with Shineki that took place earlier this month. When rumors of the plan began to swirl late last month, about a dozen veterans organization fired off a letter to Obama stating their fierce opposition to the proposal.